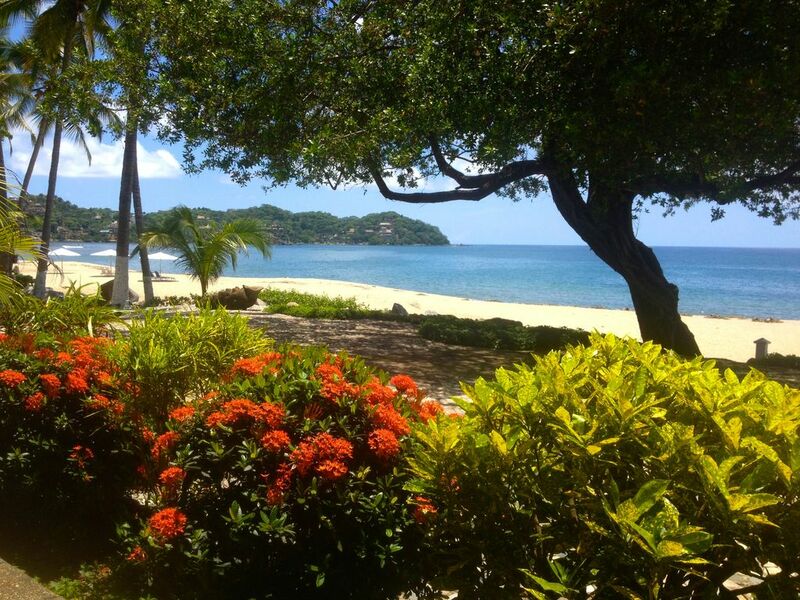 Best Beachfront House in Sayulita: Hacienda right on the sand! Set amid palm trees at the edge of a white sand beach flecked with gold, stands a gracious Mexican villa with a broad shaded veranda, offering an unobstructed view of the warm Pacific Ocean only steps away. This grand hacienda is private and peaceful, within walking distance of the center of the charming village of Sayulita. Complete with housekeeper at no additional charge and the option of having a private cook prepare meals at your request for a nominal fee, this is the perfect vacation home for a luxurious but uncomplicated beachside holiday.The villa consists of a main house with 2 master bedrooms, a living room (which can be configured as a 5th bedroom), a dining room and a large fully equipped kitchen, plus a separate 'casita', or guest house, just a few steps across the small courtyard, consisting of 2 non-connected bedrooms. The waves are often gentle enough for leisurely swims right in front of the villa, because of the smooth sandy bottom in our choice location. However, because on other parts of the beach, the ocean bottom changes to cobblestones, we are fortunate to have within sight of the house, two surf breaks that have some of the best and most consistently ride able waves along Mexico's Pacific Gold Coast. Down the beach, about 7 houses south of our villa, is the fast and exciting, left hand surf break. The more forgiving and fun, right hand break, which was the site of the Mexican National Surf Contest, is only a short stroll beyond that. Sayulita is becoming internationally known as an excellent spot for the experienced surfer as well as an ideal place for those eager to learn. MASTER BEDROOM #1 features a king-sized bed with a carved stone headboard, an exceptionally spacious bathroom and a fabulous view of the ocean including the surf break. There is built in Air Conditioning in all 4 bedrooms, including this one. MASTER BEDROOM #2 is even bigger than Master #1. It has its own private entrance, private bathroom and also has the option of being connected by a common door to Master Bedroom #1. It is spacious enough to easily accommodate a king sized bed and two other single beds. It can alternately be provided with 4 single beds. It is light and airy and like all the bedrooms, it has a fabulous view of the ocean. Like all 4 of the bedrooms, Master Bedroom #2 has built in Air Conditioning. The HIDEAWAY BEDROOM has its own separate entrance, and it normally comes with two single beds which can be configured as a king if requested. It also has a toilet in an alcove of the room behind a shell curtain and a hot water sink “ensuite”. Its window provides a view of the ocean, shaded by mature tropical trees. Because of its situation, this room is ideal for teenagers or others seeking privacy. This bedroom has it's own individually controlled Air conditioning. The upstairs EAGLES NEST BEDROOM was originally designed as an artists’ studio by the owners. It is accessed by an outdoor stairway covered with hand painted Mexican tiles. The Eagles Nest has unmatched views of the ocean and jungle as it is the only bedroom which has some windows facing in all 4 directions. This spacious, light filled, room comes furnished with a king sized bed to provide a very romantic and very private nest with a sweeping view of the beach and jungle below. The room is ample enough that, as an alternative, it can easily accommodate a king and 2 single beds or 4 single beds if arrangements are made in advance. This art studio/bedroom now contains its own brand new bathroom, with toilet, shower, glass sink and granite countertop. All bedrooms have ceiling fans, plus all 4 bedrooms also have their own, built in, individually controlled Air Conditioning. BEDROOM #5: Because the spacious living room is a mirror image of Master Bedroom #1, and it too has an exceptionally large bathroom of it’s own, it can be used as 5th Bedroom, with single beds or a king bed, if specifically requested. Unlike the 4 other bedrooms the Sala does not have air conditioning other than the sea breeze gently flowing though it. Fortunately air conditioning is rarely needed during the high season months in any of the bedrooms. Guests generally use the broad shaded veranda as their living room and dining room, because the weather is usually so inviting that everyone wants to spend as much time as possible on the veranda with the beach spread out before them only steps away. For many years I was an editor of motion pictures and television in San Francisco, Los Angeles, and New York. My wife is a fine artist/painter who grew up outside of New York City and spent her summers at their beach house on the Jersey Shore. My wife's family are Canadians who live all across Canada from Montreal to the Canadian Rockies to British Columbia. Our daughter grew up in California, loves to swim and now that we have a house on the beach in Mexico, she became fluent in Spanish and she even learned to surf. Although we have traveled all over the world to places like Bali, Hawaii, Guatemala, Europe, El Salvador, Canada, both coasts of the USA and many places in Mexico, we didn't get to Sayulita until 2000. It was the perfect little fishing village that we had been looking for, where the food is good, the local people are friendly, it's a quick easy flight from the USA, and it was the prettiest curve of beach we had ever seen. By 2001 we went back to buy a vacation home and found this perfect house right on the beach. My wife Sharon loved the classic hacienda style of the house and all the elegant antiques that came with it. My daughter Heather loved the fact that it was right on a soft sand beach where she could swim and play, and I loved that I could see two fabulous surf breaks that I could stroll down the beach to surf, within sight of the house. Less than a year after we purchased it, we loved it so much that we decided to live there full time, which we did for a year and a half to seize the opportunity to immerse ourselves in the culture, learn Spanish, and really get to enjoy this fabulous spot. We now live in Santa Barbara and visit the warm tropical waters of Sayulita as often as we can, but since we can't be there year round, we like being able to share it's pleasures with others. You have an unobstructed wide angle view of the beach which is only steps away. You have come all the way to Sayulita to spend time on the beach and in the ocean, so having a private house, with 50 meters of beachfront in the perfect spot is where you will want to be. Being oceanfront rather than up on a hill means that you will not have to walk back up the hill from the beach or restaurants or stores. You don't have to wait for everyone to go to the beach all at once, because you are already there. No need to bring anything with you. You have hot showers, towels, toilets, refrigerator all there. The living room, the broad shaded oceanfront veranda and all 4 bedrooms have ceiling fans, PLUS, all 4 bedrooms also both have, built in, separately controlled, very powerful, AIR CONDITIONING. (2) We have 2 washers conveniently located in the largest bathrooms, which are available for use by the guests when they are not being used to refresh the linens and towels. We even provide free laundry detergent. We have 2 clothes dryers conveniently located in the largest bathroom, which are available for use by the guests when they are not being used to refresh the linens and towels. We have free wireless internet for use of our guests. We invite you to bring along your laptop computer, iPhone, etc. for free wireless internet. The spacious Living Room/Sala has it's own adjacent,very large private bathroom with shower and closet so that often guests request that a King bed or 2 single beds make it into a 5th bedroom. A microwave and a coffee maker are provided. Stainless steel stove and refrigerator in our fully equipped, ocean view kitchen. Lots of books are available in our bookcase. Scrabble, Monopoly, jigsaw puzzles, and playing cards are all available. The living room (which can be bedroom #5) and the broad shaded oceanfront veranda have ceiling fans. All 4 bedrooms have ceiling fans, and also have built in Air Conditioning. We have 2 washers conveniently located in the largest bathrooms, which are available for use by the guests. We even provide free laundry detergent. Catering Available: Our housekeeper is also available for a nominal fee to shop for and cook meals for you at the house, so you can enjoy the most exclusive dining location on the beach. This beautifully appointed 4 or 5 bedroom, 4.5 bathroom beachfront home has a fully-equipped spacious kitchen. Bottled purified drinking water is provided along with linens & towels. Maid service, for an hour or so per day, 5 days per week, including the day you arrive, is already included in the price of the rental, so it is free. A tip given directly to our long time housekeeper, named Delia, is customary and I am sure is greatly appreciated by her and her family. Just a note of appreciation for allowing our group of family and friends to enjoy a wonderful week at your beautiful Casa Aguila. If there is a nicer place in Sayulita, we never saw it. The location is absolutely perfect. Far enough away from the hustle and bustle of the beaches closer to town to enjoy the beauty and serenity of the sun, sand and surf we were looking for, yet close enough to be able to easily enjoy all of the wonderful dining and exploring experiences Sayulita has to offer. You and your family are so fortunate to have discovered what we all regarded as the perfect location. Our experience was seamless from beginning to end. The house itself is so spacious and inviting. We were just able to relax and enjoy each other’s company for a wonderful vacation. Special thanks to Delia who could not have been nicer. She handily took care of anything which required attention. The few meals she prepared were delicious. Your instructions were voluminous, but were also spot on and much appreciated. It is nice to be back again in Santa Barbara, but we will always fondly share together the memories of our special time at Casa Aguila. First the good...great oceanfront location, just outside of the crowds but walking distance to the town and surf break. The house is large with ample space for our party of 8 to spread out. Fresh water is provided, and all bedrooms have air conditioners. There is a large covered patio with comfortable furniture, and a cobblestone yard to sit in the sun and watch the beach activities below. Now the bad...the accommodations are rough and not to the standards we expected for high season price. Beds and bedding were old and inconsistent, more what you might get in a moderately priced motel, far from “heavenly”. The house is dusty, with lots of ledges and chandeliers with dust and cobwebs. Floors are swept regularly, but anything above 5 feet hasn’t been touched in a long time. Appliances and kitchen supplies are old (30 years?) and limited (no sharp knives) making any food prep a challenge. Showers are barely more than a trickle and hot water is in short supply, when available, making for a less than satisfying experience. The WiFi was not working for half the trip which was frustrating, but to the owners credit, he did his best to fix it. Sayulita is wonderful, and this is an ‘A’ location, and has a lot of potential, but If this were a hotel, and we hadn’t paid upfront, we would have checked out and found something more comfortable. We want every guest to our home to be happy and enjoy their stay. If a problem exists, as soon as it is mentioned to us, we will do everything we can to address it immediately. Our housekeeper comes 5 days a week, including meeting guests on the day that they arrive to make sure everything is to their liking. We’ve not had complaints in the past but if a guest is not satisfied, they need only point it out to the housekeeper upon arrival or at any time during their stay if something arises. Guests have our housekeepers’ and my phone number as well. The city water department turns off the water on one side of town for half the day and on the other side for half of each day to allow every house to fill their rooftop water tanks daily. We are one of the very few homes in Sayulita to also have our own well, so that we can pump water up to our tank from our well, even if the town supplied water in our large tank gets emptied by guests. After hearing from this particular guest, I flew to Mexico to determine what was causing a problem with water supply. I traced our water line a block away from our property and discovered that our water line had been accidentally broken during the demolition of a wall located on another property, but it was not reported to us. This caused our pump to run day and night which overheated the pump wires, which defeated our backup system. I had the city water reconnected and also had an electrician rewire the pump so we again have reliable water with a backup system in place. It’s unfortunate that this broke during our guests stay and that the problem wasn’t able to be found immediately. I deeply regret any inconvenience to them. I have also ordered two additional new on-demand hot water heaters to be installed to get hot water even faster to all 5 bathrooms. Our stainless steel, 6 burner stove is less than 3 years old and our LG refrigerator was only 9 years old, however we are situated right on the beach, so the salt in the air tends to make all metal items appear cosmetically older than they would otherwise be, if located far from the ocean. I am sorry that this was a problem for our guest. On this trip we purchased 11 new sharp knives of various sizes and we purchased a brand new stainless steel, double door, refrigerator. There are photos on our website showing what our kitchen is like. Hopefully, everything that was a concern has been addressed. We love our Sayulita home and feel confident that our guests will also. We had a lovely time at this place. The location could not be better. Right on the water. Not too close and not too far from town. Easily sleeps 10 people. A/C in all bedrooms. It's an older house with lots of charm and antiques. We had issues with the Wifi and hot water, but the owner got them fixed when we asked. Sayulita took us by surprise. We knew we were going to be close to town, in terms of distance but we were not expecting to slowly let ourselves be totally seduced. The house has a personal and authentic charm, easy to hang out on the porch and read, or enjoy the view of the waves. This town is as easy going as it gets, friendly and makes you want to stay longer.. We surfed, paddle boarded and swam in the warm waters without any currents or worries, it was the best way to relax and enjoy our vacation. The pictures of the house, Casa Aguila, on line is what caught my eye to book this beachfront home for our family vacation... Once we arrived the views and property were even MORE breath taking and our family thoroughly enjoyed this home & location.. We are an active beach/surf family and this place did not disappoint; steps from the beach, a simple walk into town and plenty of breath taking views right from the front veranda... Our time was literally split between on the beach, on the front veranda and a little time inside to sleep and cook, but even then all had views of the ocean.... It was SO relaxing and an enjoyable week, we will definitely be back!!! Our first trip to Sayulita - now we are forever spoiled. This is a fabulous property that won't disappoint. We are already talking about going back! Thank you to Richard for being a fantastic host and to Delia for making our vacation a true delight. I am always gratified when first time renters in Sayulita, choose my property and get to experience our beautiful town from the best spot on the entire beach. I am always happy to assist my guests with useful information in any way I can, and my trusted housekeeper Delia who has been working for us, at this house since 2001, is indeed sweet, good natured, responsible, honest and a very good cook who can be hired for a nominal fee, to shop for all ingredients and prepare meals for our guests. This is yet another advantage to make it even more of a total vacation for everyone. To see our location better, on the above MAP click on the word "SATELLITE" in the upper right hand corner. Then to zoom in, click several times on the "+" in the upper LEFT corner of the map. Our property has very broad beach frontage, right on the sand. We are situated a good distance from our neighbors on either side and are fortunate to have a large grove of mature coco palms and manicured lawn as the neighboring property behind us. The sandy ocean bottom right in front of our house makes it a safer place to swim than practically anywhere along the entire beach, except for any body surfing or boogie boarding, go right in front of Don Pedros restaurant on the beach in the town center, only a short walk from our home. When sitting on our shaded veranda, one can feel very private and privileged and serene and yet the blue Pacific is invitingly close just a few steps away. We picked this spot because it is in the ideal location, close enough to easily stroll into the center of town in 10 minutes and yet just far enough from the busy center to keep out location, peaceful and quiet, and serene. EXCEPT FOR THE VERY RARE LAST MINUTE opportunity for Hugely Discounted rates such as ONLY FROM February 3-10, 2018 when the minimum booking could be for as few as 1 night, EXACTLY 7 NIGHT STAYS BEGINNING AND ENDING ON SATURDAYS are always required DURING HIGH SEASON which is from the beginning of Thankgiving week to at least a week after Easter Sunday. Then from after Easter to the beginning of Thanksgiving week in November, bookings can be for more than 7 nights and sometimes for less than exactly 7 nights and do not have to begin or end on a Saturday. Rates are subject to change until reservation is complete. Please reconfirm the actual current rate directly with the property owner before booking.